Premium Grade White Masking Tape 1" x 55 yds." Made with superior adhesives, this white tape sticks where traditional adhesives fail. Great for holding posters on walls and is removable from most surfaces. It even sticks to brick, cinder blocks, drywall, plaster and other tricky surfaces. Measures 1" x 55 yds. Premium Grade Yellow Masking Tape 1" x 55 yds." 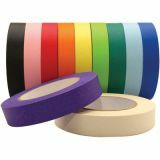 Made with superior adhesives, this yellow tape sticks where traditional adhesives fail. Great for holding posters on walls and is removable from most surfaces. It even sticks to brick, cinder blocks, drywall, plaster and other tricky surfaces. Measures 1" x 55 yds. Purple Polka Dot on Pink, 1-1/2" x 39', Snazzy Tape"
Snazzy Tape/ is our new multi-purpose /designer/ tape with a clean removable adhesive. Ideal and easy option to use as a border for bulletin boards, posters, science boards, and more. Great for decorating the classroom when used to trim marker boards, door frames, and window frames. This Purple Polka Dot on Pink, tape measures 1-1/2" x 39'. Effective way to help learners focus on learning. Highlight many learning experiences: workboards, vocabulary, spelling, etc. Teaches students how to highlight. Economy size rolls 1/2" x 720". 83% more. 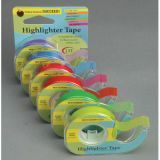 Removable Highlighter Tape, 1 roll each of six fluorescent colors"
A removable alternative to highlighter pens for all kinds of valuable permanent documents. Sticks securely, yet removes easily without damage to most surfaces. Vivid colors can/t be missed, yet transparent feature allows you to see what is underneath. Each roll 1/2" x 720". The blue highlighter tape is an effective tool that helps students focus by capturing their attention with color. Colors can help students with visual learning disabilities, to focus so they can succeed! Removable, reusable, and economical. Write on it-Highlight with it-flag with it. A /forgivable/ highlighter to learn how to highlight." Effective way to help students focus on learning. Highlight many learning experiences: workboards, vocabulary, spelling, etc. Teaches students how to highlight. Economy size rolls 1/2" x 720". 83% more.